The Peter J. Leithart & Theopolis Institute subscription includes all the Theopolis courses (and all future Theopolis Courses!) 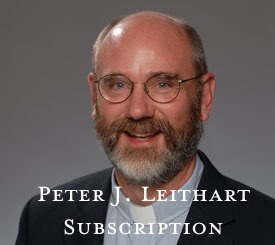 on WordMp3.com, as well as all recordings of Dr. Leithart, an amazingly creative theologian, author, professor and pastor. For this low-cost monthly subscription, listen or "stream" (but not download) all of this material. How It Works: After you purchase this subscription, you can search or browse any of the audio you have subscribed to on the entire WordMp3.com site. Just click on the listen icon to stream them immediately! Note: the easiest way to use a Subscription is to search on a talk, rather than scroll through hundreds or thousandss of mp3s. Cancelation Policy - There are no strings attached. You can easily cancel any subscription to stop the recurring billing right in your My Account section. However, you will not be refunded for any "lost time" or lack of use. Renewal: The first month will be at the Sale Price. The renewal cost will be charged at the ordinary price, rather than the sale price. Cancelation Instructions: To cancel your subscription, visit this page while you are logged in. Click "Manage Subscription" above, and look for the "Cancel Subscription" button.